Kristin Creative: Who's Been Hoarding the Awards?! I've been getting some fabulous awards from some fabulous bloggers and have neglected to pass them around!! I must make amends, and quickly! I believe I have eight of them that I've stacked up, so I'm just going to tackle them in parts. 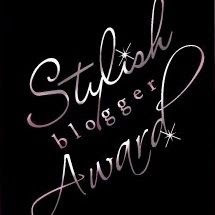 The Stylish Blogger Award, given to me by the stylish blogger, Jen at Unedited! Muse in the Fog - Following this blog has introduced me to a genre I hadn't read much of in the past, but am now learning more about: Historical Fiction! Her reviews are must reads. Abby Annis - Her blog is fun, full of great advice, and she often highlights a lot of the YA books we love so much! She also has a great 100 follower contest going on right now. 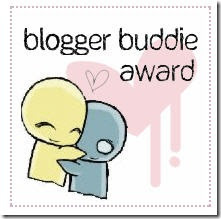 Next up is the Blogger Buddie Award, given to me by Amelia and Amber! Be sure to check out their fabulous blogs! Jen at Unedited - She's a pretty cool chick with a pretty cool blog, and recently celebrated 200 followers! Congrats on that! Nicole Ducleroir at One Significant Moment at a Time - Great discussions, great teasers, just an all around great lady! 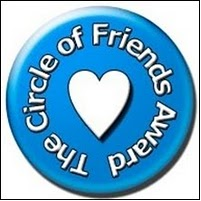 Next up is the Circle of Friends Award, given to me by fellow Team Gale supporter Katie! Kim Franklin - Kim has become a good friend, and to top it off, her blog is hysterical and full of great advice, not to mention her very helpful book reviews! Kristi Chestnutt - Also a new and dear friend, Kristi's debut novel comes out THURSDAY! 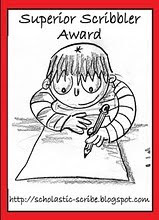 Last for today, but not least, The Superior Scribbler Award given to me by Tiana Lei! DL Hammons at Cruising Altitude - DL is just an all around cool guy. He has great advice, is a good writer, and always leaves encouraging comments. He's a superior scribbler! Kayeleen at Kayeleen's Creations - Kayeleen is a super-sweet, young adult writer, with a lovely blog that everyone should follow! WHEEW! Stay tuned for the second part of this award ceremony at a date TBD! 2. Someone once told me, "Hate is a waste of emotion." Ever since, I've tried not to hate anyone or anything. I even try not to ever say "I hate you!" even playfully. It just sounds ugly. But I will say this: I just scrubbed our guest bathtub... and I was pretty close to hating that. 3. I have a hard time buying someone else's artwork because I have this weird personal..what's the word...it's like a feeling...not really a "bet"...argh. Can't think. Anyway, I feel like I'm supposed to create all the artwork for the walls in our house myself. Like I will have failed if I don't. I'm slowly getting over it - mostly because our walls have been bare for 2 years because I don't have confidence in my own art to even display it! - and I bought a couple of watercolor paintings from some locals while we were in Italy (and a couple from Hawaii). I'm also slowly cluttering my walls with photos I took on vacations, too. 4. I freak out when my feet feel the slightest bit dirty. It's vital to wear flip flops here in Houston in the summer when it's 100+ and you feel like you're constantly in a sauna, but wow do your feet get dirty!! I'm the queen of the quick fix of a lightly soaped and damp paper towel swipe of the feet in public restrooms, and I give them a good thorough wash cloth cleanse as soon as I get home. 5. I LOVE gift cards. Some people think these as gifts are impersonal, but you know what I say to that? Let ME pick out what you want to buy me, because no one knows me better. I think people are catching on, because yesterday for my birthday I got the most gift cards I've EVER gotten. iTunes, Borders, Hobby Lobby, Michaels, World Market!!! Add that to the Barnes and Noble gift card I won last week from Clevery Inked and I'd say I have a FULL day of shopping in the near future!!! If you haven't entered my contest for a signed copy of Heist Society by Ally Carter or a $10 Amazon Gift Card, you can do so on this thread! Gee...look at all that hardware!!! Why am I acting surprised...your blog and the heart you put into it deserves each and every one. And thank you so much for my award, especially since its pretty much gender-neutral. :) I'm touched by your words of praise. Like I always tell my kids..."consider the source"...and when I do that...they truly resonate. WOWSA -- congrats on all the awards! First, congrats on your well deserved awards!!! Houston is disgusting your right about it being a sauna to wear flip flops are necessary!! But the feetsies do get dirty! Oh and I think gift cards rock!! You HAVE been hoarding awards! Congrats on all the awards! And yea for snow on your birthday--that's so fun! Yay for award day!!!! Thanks! I totally needed this today and I love it! I shall display it proudly over the weekend! I LOVE reading little snippets about people's odd things...the foot thing cracks me up and I can totally understand. AND I totally think "haste is a waste of emotion" is GREAT ADVICE! *exept where bathrooms are concerned* lol. Thanks for the award! Yay! You are awesome. Gift cards are the best gifts EVER!!! Kayeleen - I will totally look into your suggestion! It also sounds like something that can contribute to my Jane Austen Challenge!! Erin - if you love gift cards, don't forget to enter my contest!